Recently, a friend posted her author bucket list–a list of things she wants to accomplish as an author/writer before she dies. Her post at FaithSimone.com inspired me to think about what I want to “check off” as an author/writer before I “check out.” I’ve always kept a list of goals as a career guide and because of that it took me a while to understand the difference between goals and a bucket list. But once I separated the two in my mind, I had a ball creating my wish or dream list. Below is my list. What about you? 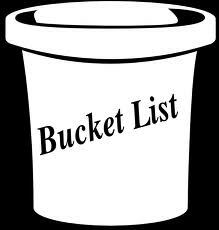 Do you have a personal, career or professional bucket list? If so, feel like sharing? 1. To have publishing credit in multiple categories/genres: children’s, screenwriting, romance, horror, etc. 2. To attend at least one of the premier literary awards ceremonies: Nobel Prize, National Book Award, Academy Awards, etc. 3. To buy a writing retreat; a private oasis where I can visit, think, dream and write. 4. To have lunch with Toni Morrison and Stephen King, individually. 5. To establish a scholarship for young African American creative writers. 6. To establish a stipend-based award for adult African American creative writers. 8. To attend an international writers retreat and/or conference. 9. To attend a major literary event in NYC, the mecca of the US publishing industry, such as the Harlem Book Fair.